Your about page is essentially what will enable readers to get a deeper insight to who you are, so it has to be clear, concise and if you prefer, detailed. Figuring out the perfect pitch can be frustrating but there’s no way about it and you need to spend a lot of time on writing your bio. As well as your readers wanting to know about you, they are also going to want to know what exactly it is that makes your blog useful to them. Make sure that you are clear on what it is your blog is about and the type of person it is aimed at. People often overlook this aspect not realising how important it is. Before writing anything, you need to know who your audience is because it will help you figure out the right things to say for them to be able to relate to you. There is no harm in writing about yourself in your bio but your readers will be interested in what you bring to the table and how it will benefit them. Some things to consider when writing your ‘about me’ section is: what type of things you will write about, what people will get from reading your posts, why they should be reading your blog and also how your site got started. Think of your “about me” section as an introduction to who you are. Your bio doesn’t need to be long or overly personal but also, you don’t want to be too professional and inhumane as that can seem boring. What you could do is to find a balance between being personal and professional and make it fun! Some other things to take note of is that your bio is best written in your own voice and in the truth. Write to your desired audience and update that section regularly. The secret to writing a great “about me” section is sharing what your readers would find relevant. Also, make sure what you write about in that section is relevant to what your blog. Things like what school you went to or what your favourite colour is provides a nice insight to your life but it’s not really relevant. If you want to talk about something that’s not relevant, then make it interesting at least. Having a photo of yourself on your bio lets people know who they are working. 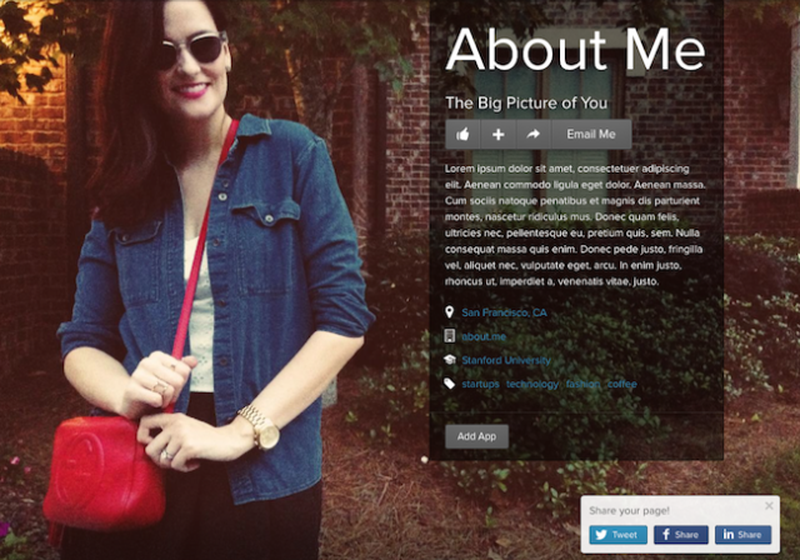 Plus it creates a personal touch which is vital to how to write about me page. Readers will be able to identify you and put a face to the words. Your photo doesn’t have to be a professional one, just make sure you look nice and neat. Smile if you can too. Photographs can be a form of good branding so make sure you include a decent photo of yourself on your page. Be yourself instead of being fake. Establish what you want to achieve with your blog as it can bring you closer to your goals. It’s also a great way to attract the opportunities you want too. If you’re not yourself, then how do you expect the right opportunities to come your way? Always remember to live your truth. Think of something to start the opening of your bio with. Introduce yourself, explaining what you do. Talk a bit about your personal story in an engaging way and mention why you’re writing in this way. Try something new and think outside of the box. After talking about yourself, direct them to where to go next. You can do this by hyperlinking a blog post of yours. They have read about you already so offer them an opportunity to get familiar with your content too. Create an opportunity for your readers to communicate with you through other ways. You can do this by leaving a link to your social media pages, your email address or have them subscribe to your newsletter or blog. This is great way to retain readers, build loyalty between you and them and also a great rapport. Continue refining your bio just because you can. Writing for the web and not print publications means that you can always change, add or delete things from your blog. Don’t worry about your about page being too short or heavily detailed. If you think it could be better, then get friends and family to give you feedback. Keep changing your bio until you are satisfied with it and feel that it resonates with your ideal client or audience. Your about page is important for clients because they can use it to decide whether you would be an ideal person to hire. A great bio can lead to clients who will pay you if it details ways you can help them with their needs or project. A brilliant about page is a mixture of professionalism, personality and influence so make sure you throw these elements into the mix. It is important to acknowledge your readers and make them feel involved in what you are doing. A good way you can do this is by thanking your loyal readers for visiting your page and even the new guests too. Also, as some bloggers do, take the time to get to know your readers if possible because that way, you are building a nice community of your own. Be loud, clear and let your personality shine through in your about page. This really draws readers in and creates a personality that they can become accustomed to. Also, it doesn’t hurt to have a mission statement or state what your core beliefs and values are, as it will help people know what to expect from you. You can gain the trust of your readers and also inspire them by telling them what you believe in. Some bloggers do this and because of the fact that they do, a certain type of audience was attracted– usually one that shares the same type of beliefs.